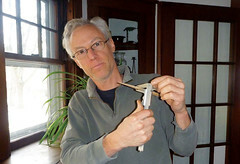 A version of this article appears in the September/October 2012 issue of Home Energy Magazine. How well does plastic V-strip work? How well does it hold up over time? How can you tell ahead of time if a particular window will benefit from V-strip? For example, can this be determined during an energy audit? How long does it take and how much does it cost to properly install V-strip? How does plastic V-strip compare to metal V-strip, for savings, installation, cost, and reliability? Figure 2. The average speed of V-strip installation. 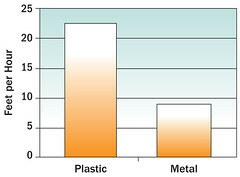 Figure 3: Installation costs for plastic versus metal V-strip. Figure 4: Air infiltration with varying window configurations. Figure 5: Average infiltration reduction graphed against the gap for each house. We installed self-adhesive plastic V-strip weather-stripping on wood-framed double-hung windows in six houses. In these houses, plastic V-strips reduced air infiltration by 5%–13%, with an average of 9.2% reduction. Average air infiltration reduction per house was 314 CFM50. We divided whole-house infiltration reduction by the number of windows in each house to find average air infiltration reduction of 20 CFM50. Average air infiltration reduction per foot of V-strip installed was 1.6 CFM50. The installed cost of plastic V-strip was estimated at $2.75 per linear foot, about $35 per window on average, and $550 per house on average. These figures include material costs and labor costs at a rate of $58 per hour, which we obtained from the RS Means Repair and Remodeling Cost Data handbook (2010), for the classification of “building laborer.” (It may be on the high side for our industry, but we wanted to be conservative.) Despite variations in window age and tightness, the installation of plastic V-strip was cost-effective in all six houses, saving an average of 54.7 therms of natural gas annually, or about $82 per year. This translates to a Savings-to-Investment Ratio (SIR) ranging from 1.2 to 2.3 for the six houses tested. A comparison test of metal and plastic V-strip showed that metal performed better. The metal V-strip reduced infiltration by 8.5%, while the plastic V-strip reduced infiltration by 4.6%, when compared apples-to-apples for the same house. Metal V-strip, however, is more costly to install, and it does not fit on all windows; for example, it is often too thick to be installed between the sash and jamb of a typical double-hung window. Metal V-strip also makes windows far more difficult to open and close, whereas plastic V-strip only causes a small increase in the force required to open and close windows. When installed carefully, plastic and metal V-strips hold up well over time. Surface preparation is very important. If surfaces are not prepared properly, plastic V-strips will not stick. Failures typically happen soon after installation if surfaces are not prepared. Both plastic and metal V-strip are vulnerable to “catching” at the window latch, unless they are installed in a way to prevent such a failure. We experimented with two kinds of V-strip weather-stripping. The first was a thin, flexible plastic V-strip with an adhesive backing. The second was a significantly thicker, stiffer metal V-strip that required nailing. Plastic V-strip was installed on the bottom rail of the lower sash and the left window jamb. V-strips were placed along the bottom rail of lower sashes and top rail of upper sashes, as well as the top rail of the lower sash where the lower rail of the upper sash makes contact. V-strips were also placed along the parting beads or jambs, depending on where there was a wide enough gap for V-strips to be installed. The parting bead is typically a piece of wood that sticks out from the jamb and guides the sash. In other words, the sash sits between the stop and the parting bead. See Figure 1 for window terminology. Blower door tests were run four times in each house—each test with a different window configuration. Test 1 was run with the storm windows closed, before any weather-stripping. Test 2 was run with the storm windows open, also before weather-stripping. Test 3 was run with the windows V-stripped and the storm windows closed. Test 4 was run with the windows V-stripped and the storm windows open. 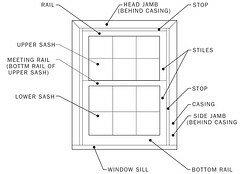 The width, height, gaps (between sashes and stops, and between sashes and side jambs), and total length of weather-stripping installed were recorded for each window. The force required to open and close each window was measured with a force gauge before and after V-strips were installed. Windows were opened and closed 20 times to test for premature failure of installed V-strips. Surface preparation is important. If surfaces are not properly prepared, plastic V-strips will not adhere and will fail prematurely. Our surface preparation included sanding (both with sandpaper and an abrasive pad), vacuuming and wiping with a damp paper towel. The only failure we experienced occurred to V-strips located along the back side of the top rail of the lower sash, where the two sashes meet. 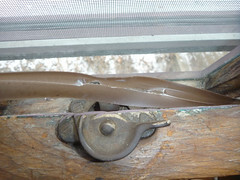 When sliding the lower sash up, the V-strip would get caught on the window latch on the bottom rail of the upper sash. This problem was not limited to plastic self-adhesive V-strips; it also occurred for nailed metal V-strips. When operating windows normally, this snag was enough to rip metal V-strips from their nails, as well as completely detach or destroy plastic V-strips adhered to the rail’s surface. To prevent this problem, we recommend that V-strips be installed on the front side of the lower rail of the upper sash. This problem occurred only during the test in which windows were opened and closed 20 times after initial installation of the V-strips. To test the longevity of V-strips, we built a test rig with a double-hung wood-frame window and an automatic actuator, which repeatedly opened and closed the window. For this test rig we placed four V-strips (one on the stop, two on the jamb, and one on the parting bead). There was one strip on the lower rail of the lower sash, and two strips between the upper and lower sashes. Each V-strip location was tested with both metal and plastic V-strips. The window rig was opened and closed 15,375 times, with no separation of V-strips from the surface, and minimal signs of wear and tear. This number of cycles represents the equivalent of about 40 years of operation, assuming one open/close cycle per day. 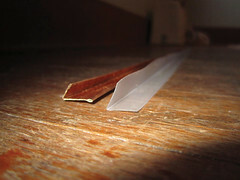 Traditionally, both plastic and metal V-strips have been presumed to have fairly short lifetimes. The accelerated life testing showed that, if properly installed, both plastic and metal V-strips will mechanically last for over 40 years. We did not test for the impact of temperature, humidity, and UV exposure variations. Until such data are available, we recommend based on our experience that the life expectancy be treated as 15 years for plastic and 20 years for metal. The key to avoiding premature failure is to properly prepare the surfaces, fasten the strips securely, install them in a manner in which they will not be caught or snagged by the latch, and avoid applying them at low temperatures. After installation of V-strips, windows should be opened and closed a few times to test for premature failures. The ideal thermal imager for today’s building thermographer does not necessarily need to be top of the line or the most expensive. Installing plastic V-strips on double-hung wooden windows is a cost effective improvement. Although metal V-strips may be more durable, they are also much more difficult to replace when damaged. Plastic V-strips can be replaced without disassembling the window, and removing plastic V-strips is easier. The average time it took to install plastic V-strips was 8.8 hours per house, or 22.4 linear feet per hour, or 34 minutes per window. By way of comparison, metal V-strips (for the one house where it was installed) took 11.3 hours, with 9.0 linear feet per hour, and 52 minutes per window. See Figure 2. 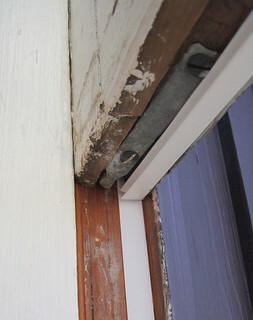 It should be noted that in this house, the metal V-strip was only installed on the lower sash, so the important comparison is on the basis of linear feet per hour: The metal V-strips take more than twice as long to install, per linear foot, partially due to the fact that window sashes have to be removed for proper installation. Average installed costs for the plastic V-strip, including both material and labor, and assuming a labor cost of $58/hour: $550/house, $35/window, and $2.75/foot. By comparison, the metal V-strip was $7.49/foot to install. See Figure 3. Installing plastic V-strips required sanding, wiping, and vacuuming all surfaces planned for adhesion of V-strips. Often V-strips needed to be slid forcibly into place in the gap between the sash and the jamb, which was more difficult on tighter windows. Metal V-strips, on the other hand, required no surface preparation, although we had to take the sashes completely out of the frame for installation. Metal V-strip weather-stripping required more labor and the use of tools such as a nail gun, hammer, screwdrivers (for removing stops), and putty knives (for fitting sashes back into window frames). and life expectancy of 15 years for plastic V-strips and 20 years for metal V-strips. The SIR was greater than 2.0 in two cases, and averaged 1.7 for the six houses. In one house, an apples-to-apples comparison of plastic versus metal V-strips showed that metal V-strips saved 60 therms annually, which translates to $90 per year in savings, and the plastic V-strip saved 32 therms annually, or $49 per year. The SIR of metal V-strips was 1.49 (See Table 1). The results for metal V-strips are based on tests in only one house, where the windows were very leaky, making results a little harder to generalize. Do Storm Windows Reduce the Benefits of V-strip? The results presented above are for windows with storm windows open. Most of the houses we tested did in fact have storm windows. With the storm windows closed, blower door test results found that average air leakage was approximately 60 CFM50 lower per house, which means houses were 3.2% less leaky (see Figure 4). On average, the infiltration reduction achieved from the installation of V-strips when the storm windows are closed was 213 CFM50 or 6.0% per house. This translates to a 2.0 CFM50 reduction per window and an average SIR of 1.2. Only two of the six houses had SIRs of less than 1.0 when storm windows were closed. When storm windows are closed, savings from V-strip weather-stripping are reduced. However for our closed storm window tests, we made sure to properly close each and every storm window. Often storm windows are not present or are not closed. In these instances, V-stripping windows will provide the additional savings of our “open storms” tests. How Much Harder Is It To Open and Close the Windows? We measured the force required to open and close the windows, before and after weather-stripping, with a force gauge and we found that V-strip weather-stripping does make windows harder to open and close. For metal V-strips, average measured force to open windows was 1.5 lbs before V-stripping and over 44 lbs (the limit of the force gauge) after. The force to close windows with metal V-strips went from 10 lb to over 44 lb. This increase in required force made windows with metal V-strips difficult to operate. Average measured force to open windows with plastic V-strips was 21 lb before V-stripping and 28 lb after. Measured force to close plastic V-stripped windows changed from 8 lb to 14 lb. Overall, plastic V-strips did not make the windows become significantly more difficult to operate. An operable window moves and rattles when it is in a closed position. A length of thread or bathroom tissue held near a window or door indicates air movement through a crack. Outdoor light can be seen through a crack from inside the house. A piece of paper slides easily through a closed opening. Turning on exhaust fans in the house and seeing if smoke from a smoke puffer at the windows indicates infiltration. We ran all of these tests and found that 5 of 19 windows tested across the six houses did not rattle, 12 of 19 windows did not show air movement with a thread or tissue, 8 of 19 windows did not indicate any light, 5 of 19 would not allow paper to be pulled through, and 4 of 19 did not show smoke movement when exhaust fans were turned on. Although these tests are easy and convenient, each of the above tests was found to be inconclusive. 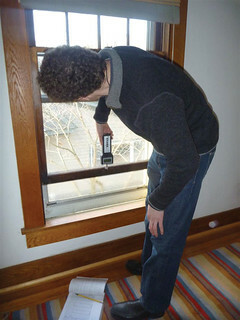 For example, when examining the two windows in our study with the smallest gaps and the two windows with the largest gaps (as measured using a feeler gauge or calipers and a wooden shim), we found that there was no recognizable correlation to be made between the outcome of the tests to determine need for weather-stripping, and the window gap sizes. Windows on both ends of the gap spectrum rattled, allowed paper to be pulled through, allowed light to pass through cracks, and indicated air movement using either a length of thread or smoke. We examined one further test, by measuring the gap with a feeler gauge. Figure 5 shows the average infiltration reduction (per foot of V-strip installed) graphed against the average gap, for each house. For the six houses studied, as the average window gap increases, the infiltration reduction decreases. In other words, as the window gap gets bigger, the savings go down. But we also intuitively know that if the gaps had been extremely small, adding weather-stripping would not have reduced infiltration. So we added an extra known point to the graph at 0 gap and 0 savings, and ran a curve fit through the points, superimposed on the test results in Figure 5. This would indicate that if the gap is over 0.15 inches, there may be little savings, likely because the gap is too big for the V-strip to reduce infiltration. Also, as the gap gets very small, we expect savings to go down as well. It is hard to tell where the gap is too small. The figure might point to a gap of 0.02 inches, although at this point the window will likely start to get too difficult to open and close. Though this analysis requires a number of assumptions, based on our tests, we can confidently recommend V-strips for gaps between 0.07 and 0.12 inches. 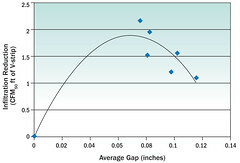 Extrapolating from our results, plastic V-strips will likely provide good savings down to gaps of 0.02 inches and up to gaps of 0.13 inches, but caution should be taken at the smaller gap sizes, to make sure the windows open and close easily, and at the higher gap sizes, to ensure that infiltration is in fact being reduced. For larger gaps we recommend using metal V-strips, keeping an eye on making sure windows are not made too difficult to open or close. Most importantly, inserting a shim and then using calipers on the shim is a fast and convenient way to assess windows for the suitability of V-strip during energy audits. As we noted, plastic V-strips worked in all six of the test houses, so if you cannot measure the window gaps, it is fairly safe to install plastic V-strip wherever it does readily fit. For more information on Taitem Engineering, visit www.taitem.com. Installing plastic V-strips on double-hung wooden windows is a cost effective improvement—one that can be reliable and last for many years as long as the initial installation is done well. Though metal V-strips are better at reducing air infiltration, they can cause windows to become difficult to operate and require that window sashes be removed in order to properly install them. Plastic V-strips are cheaper, easier to install, and more versatile than metal V-strips and are therefore a good choice for reducing air infiltration in windows. Victor Shelden is a recent graduate of Ithaca College with a degree in Environmental Studies and concentration in Alternative Energy Design. Since then, he has been working at various environmentally focused organizations in hopes of landing a career in building efficiency and “green” energy. Ian Shapiro, P.E., is the president of Taitem Engineering, which he founded in 1989. Since then, he has led several energy research projects and done many energy audits, and was blown over by window air leakage during a blower door test in his own house. The work described in this article was conducted by Taitem Engineering for New York State Homes and Community Renewal, as part of field training and technical assistance for the state Weatherization Assistance program. Bill King and Nick Kirk led the field measurements and reliability testing. Evan Hallas provided review and Beth Mielbrecht managed the project. © Home Energy Magazine 2019, all rights reserved. For permission to reprint, please send an e-mail to contact@homeenergy.org. Discuss this article in the Best Practices (Residential) group on Home Energy Pros! While we will do our best to monitor all comments and blog posts for accuracy and relevancy, Home Energy is not responsible for content posted by our readers or third parties. Home Energy reserves the right to edit or remove comments or blog posts that do not meet our community guidelines.